There’s a standard joke that circulates in the Episcopal Church and usually makes its way into confirmation classes. No matter what you believe, there is bound to be at least one Episcopalian that agrees with you. As with all humor, there is a kernel of truth in that aphorism. But after today’s joint session of Deputies and Bishops to discuss the structure of the Episcopal Church, the veracity of that joke has been challenged. Breaking into small groups for conversation and using #gcgas on Twitter, the Deputies and Bishops shared ideas about what to keep and what to change in the governance of the Church. 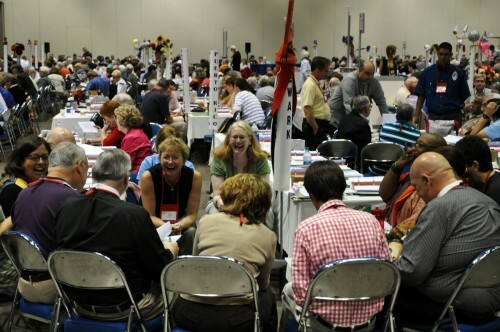 Everything was up for grabs: provinces, dioceses, Executive Council & Staff, and General Convention. The ideas of what to keep and what to change cut across traditional theological camps and geography. Even representatives from the same diocese disagreed publicly on Twitter. The Church needs to take two lessons from this conversation. First, this General Convention, the next Presiding Bishop, and Executive Council have an extraordinary task in front of them. Part of their task will be to find some sort of consensus among the wide and varied opinions. While many voices expressed their desire to retain certain structures of the Church, just as many if not more shared what they wanted to change. Judging from this joint session, it appears that nobody wants to keep the status quo. More importantly, however, the Episcopal Church should learn that there is room for conversation. By opening up the discussion in a truly open fashion (using a hashtag on Twitter), an overwhelming variety of voices were heard and shared. This was a great moment in the Church’s use of the truly democratic nature of social media (though many made euphemistic jokes about the hashtag). Unlike the floor of General Convention, which is highly controlled by a select group of insiders and parliamentarians, the conversation on Twitter actually created space for conversation. No one had to wait in line for a microphone and hope to be recognized. No one had to be approved before sharing their opinion. Today was a truly open conversation. If part of the concern with a unicameral legislative body for General Convention is that the democratic process would be curtailed, then today’s use of open discussion on Twitter should be used as a model for future conversations. This is an opportunity for our Church to boldly step into the future, a future that is not controlled by presiding officers or parliamentarians. Imagine a Church in which anybody can join the conversation whether they are lay, ordained, at home on their sofa or sitting at General Convention. That is the Church of the future.